Zachary T. Schafer, Coleman Assistant Professor of Cancer Biology at the University of Notre Dame, has been awarded a Research Scholar Grant from the American Cancer Society (ACS). The $792,000 grant is for a four-year period and will support Schafer’s research project titled “The Evasion of Detachment-Induced Metabolic Defects in Breast Cancer.” The grant was made possible by Lee National Denim Day, a fundraiser created by Lee Jeans in which participants donate $5 or more in exchange for the opportunity to wear jeans to work. Since its inception in 1996, the fundraiser’s participants have raised more than $91 million for the fight against breast cancer. Funds raised support the American Cancer Society and its breast cancer programs and services. 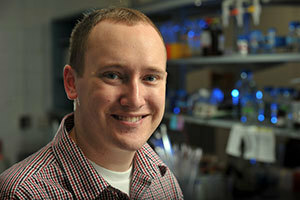 “I am very humbled and thankful for the American Cancer Society’s support of my research program,” Schafer said. “This award will allow us to move forward rapidly on this project. Schafer pointed out that the overwhelming majority of cancer deaths are caused by cancer cells spreading from the site of the primary tumor to more distant sites, a process known as metastasis. Unfortunately, despite its importance, very little is known about the precise molecular mechanisms that allow cancer cells to metastasize. It is well-known that in order to allow the metastatic journey to distant sites, cancer cells must shut down anoikis, a cell death program that is typically activated if cells leave their normal environment. However, Schafer’s recent research has discovered that in addition to shutting down anoikis, metastatic cancer cells must fix defects in nutrient consumption in order to survive outside of their normal environment. Schafer’s ACS-funded research project will build upon this discovery by systematically investigating and identifying the precise mechanisms used by cancer cells to fix these defects in nutrient consumption. His preliminary studies have identified two key proteins, catalase and SGK-1, that are involved in the maintenance of proper nutrient consumption in cancer cells. This project will further examine these and other related proteins so that a thorough understanding of how they help cancer cells survive can be attained. In addition, he will use an unbiased approach to look for novel regulators of nutrient consumption in cancer cells. Following the completion of this project, Schafer hopes to have substantially improved knowledge of how cancer cells regulate nutrient consumption to allow for their survival during metastasis. Subsequently, he and his fellow researchers can use this information to move towards his laboratory’s long-term goal of reducing cancer metastasis and mortality through the design of novel drugs that induce cell death in metastatic cancer cells. Originally published by William G. Gilroy at news.nd.edu on July 21, 2014.